Customize the look of your bathroom. Are you ready to upgrade your bathroom? 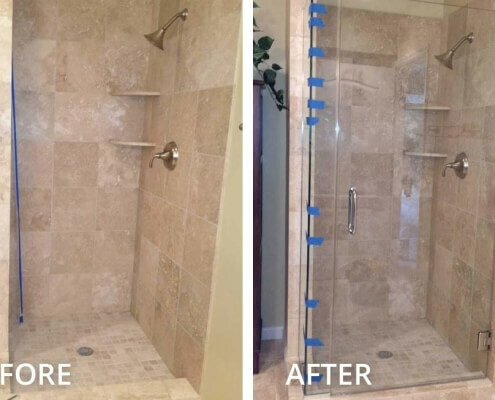 Get started by creating a custom shower door look that will really stand out. At Residential Glass, we offer a variety of styles to match your desired look. We tackle all of our work with skilled craftsmanship and attention to detail and make sure that you are 100% satisfied with the final product. Shower glass installation is as easy as 1-2-3. Don’t know where to start with your project? Give our team a call! We will schedule an appointment to come out to your home and discuss the aesthetic you are after. Once we have compiled all of the necessary information, we will be able to provide you with your free quote. When your time and money is involved, you expect nothing the best quality, and we want to ensure that the job at hand is completed with no hiccups along the way. That is why our team will come out to your home to measure the shower space ourselves. If any inaccurate measurements are taken, we will reorder the glass at no additional charge to you. Say goodbye to a stressful home renovation project. 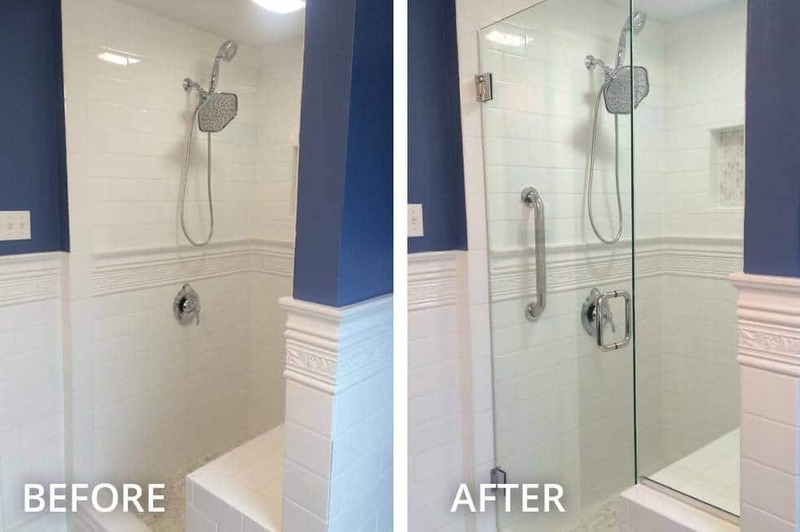 Our team will manage the entire process from beginning to end while providing you updates regarding your shower door throughout the entire installation. If any delays are expected, our team will communicate with you, so you have the peace of mind that you left the job in the right hands. We want all of our customers to be 100% satisfied with our work. That is why you will receive a 12-month warranty on your install and a 5-year warranty on the glass installed. If you run into a problems after we complete the job, we will come back out to fix it. 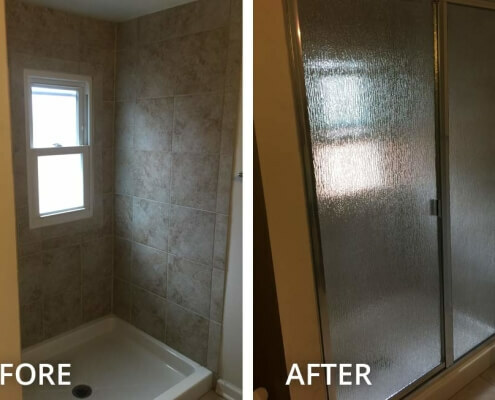 Whether you like a clean, sleek look or a framed, bi-fold door, we have a variety of shower glass door styles to fit the look of your home. 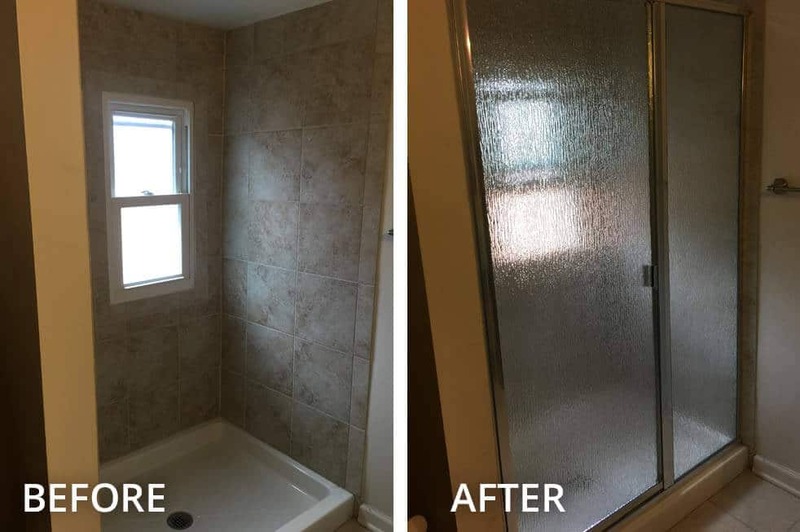 We strive to provide our customer with the desired look they are after, which is why we offer fixed panels, frameless, framed, and rolling shower doors. Our ultimate goal is to make your vision a reality. To achieve your desired look. We have a wide array of hardware options and finishes to match your home’s look. When we come out to your home, we will sit down with you to get a better idea of what you would like the final product to look like and price out your hardware options, so you have an accurate quote. Do you have a question you want to ask? Take a look below! 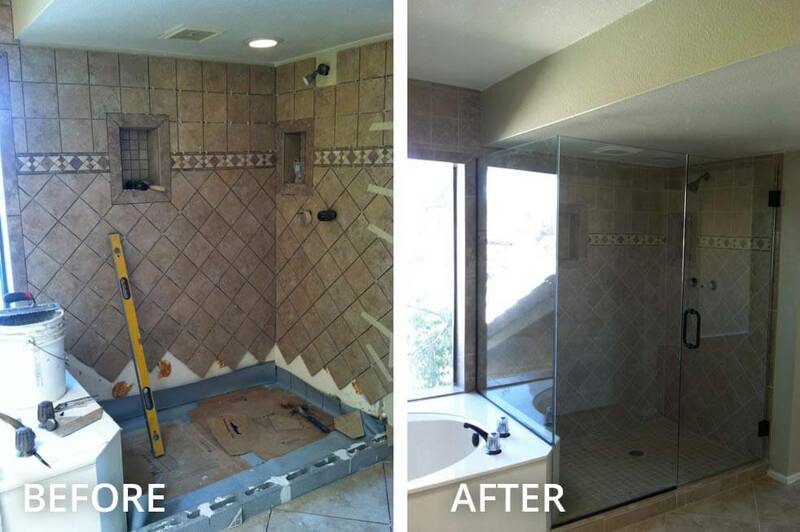 Get ready for your bathroom remodel before you give our team a call. We answered some of our most commonly asked questions! What thickness of glass should I get? 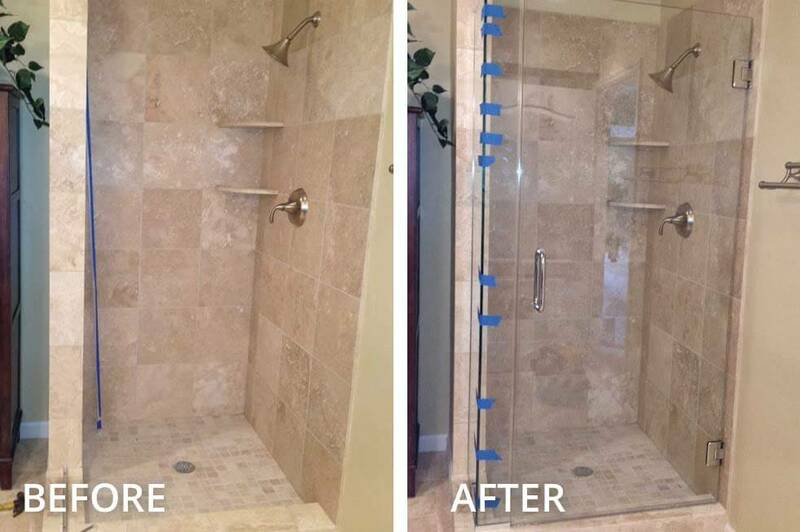 We offer 3/8″, 1/4″, and 1/2″ glass thickness with our shower doors. The 3/8″ thickness tends to be the most popular selection when choosing a thickness; however, we can go as low as 1/4″ if that is the desired look you are going for. Can I measure the glass for you? To avoid any mismeasurements or additional costs to your install and project, we suggest that all measurements are taken by our team. If we measure incorrectly, you will not endure any additional costs to your project. How long does it take to have my shower glass installed? After we provide you with a quote and receive a down payment on the project, it will take 10-14 days for us to receive the glass. Once we have the shower door glass, we will be able to install as soon as possible. Can you install a shower door on a fiberglass tub? Unfortunately, there is not enough strength for a frameless shower door to be installed on a fiberglass tub. We can, however, install a shower door on tile. When can you install glass in a new home? 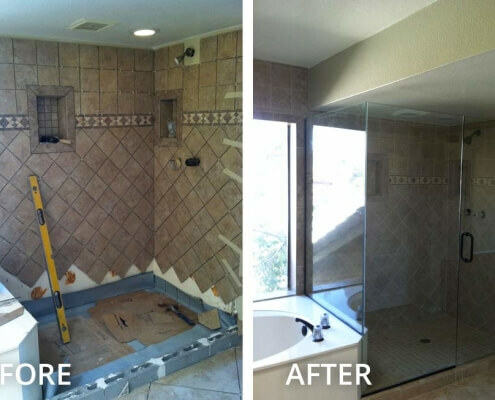 As soon as your home and bathroom space in level, we will be able to tackle our job! If any portion is slightly off balance, it can affect the outcome of the install. Do you offer more than clear glass for showers? We offer a variety of finishes and textures when it comes to the glass you select for your shower door. 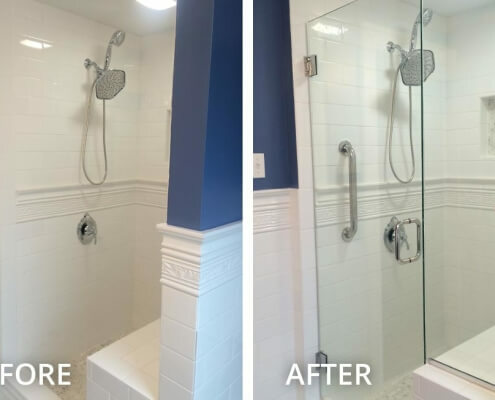 Most customers select clear glass, but we have options to match your design aesthetic!